Please welcome WC Bauers to the blog! His new book, Unbreakable, just came out and he kindly answered a few of my questions about it, and more! Also, courtesy of the nice folks at Tor, I’ve got a copy to give away to one lucky winner (US/Canada), so be sure to fill out the widget at the bottom of the post to enter! Congrats on the new book! Will you tell us a bit about Unbreakable, and what inspired you to write it? Thank you, and thanks for hosting me on your site. UNBREAKABLE is the first in a series of books about mechsuited Marine Promise Paen. I posted about the genesis of her name on my blog so I won’t elaborate about it here. But I’ll say this: life is tragic and it’s hope-filled. It’s a both/and proposition. I didn’t name her lightly. Three years ago, Promise came to me with a story to tell. She’d lost her family and her home in a series of pirate raids on her homeworld. She was looking to get off-world, to get out. I suggested she enlist in the RAW-MC and see the ‘verse. After five years, I sent her home to face her demons, right before the planet was invaded. UNBREAKABLE is the tale of a young woman coming to terms with her past while learning what it means to serve the greater good, all within the context of a world under siege. What did you enjoy most about writing Marine Lieutenant Promise Paen’s character, and why do you think readers will root for her? Promise loves to do hard things and, sometimes she doesn’t know when to quit or back off. Her greatest strength is her Achilles heel. Her “can-do” moments are some of my favorite scenes to write. I never quite know what will happen. Though I do a bit of plotting for my books I’m definitely more of a discovery writer. A lot of people died in UNBREAKABLE. I swear I didn’t do it. I found them that way. What supporting characters did you enjoy writing the most? Maxi for one. He’s Promise’s best friend and a real scrapper. One day, Promise’s mother, Sandra, appeared from the other side of the grave. I wasn’t expecting her and she never tells me when she’s going to show up. Honestly, the woman intimidates me. I read a lot. Books like THE RED CIRCLE by Brandon Webb and Clancy’s MARINE: A GUIDED TOUR. I recently finished John Nagel’s KNIFE FIGHTS, which explores the evolution of counterinsurgency doctrine (COIN) in the Iraq War. You’ll most always find a book of military history or a war memoir on my nightstand, or a mil SF. Many of my friends and family are active and former military. A handful volunteered to read the early draft of UNBREAKABLE. I asked them not to hold back and they didn’t. One of my mentors is a retired Navy commander, a firearms instructor, and a gunsmith. He went above and beyond to help me. I spoke with a medically retired Army sergeant who spoke Arabic and used to deploy with the Teams. I sought out a retired Marine Corps pilot and an Army tank commander. I asked questions. I listened. You describe Unbreakable as “a bit Starship Troopers, a bit Esmay Suiza, and a dash of Firefly”, which is awesome. I’m guessing that you’re a fan of Elizabeth Moon? What are a few of your other favorite authors? Who would you say has influenced you the most in writing, and in life? Yes, Elizabeth Moon for sure. She’s someone I’d love to chat with one-on-one. Dayton Ward actually wrote the Starship Troopers/Suiza/Firefly blurb and I ran with it, and I couldn’t stop smiling for days. David Weber’s books have meant a lot to me. I wanted to name my daughter Honor but my wife wouldn’t have it. We ended up with three boys. I read STARSHIP TROOPERS after writing UNBREAKABLE, after Dayton’s blurb came in, and I think I understand his comparison. Heinlein wrote a realistic tale of war…with bugs. Lots of killer bugs. I was going for something realistic too. But no bugs. Eighteen months of Hawaiian roaches was enough for me. Being on the same page with Heinlein, Elizabeth Moon, and Dayton Ward is a real honor. I inherited my love of reading from my mother. She was always feeding me books and forcing me to read. Something. Anything. When I discovered SF/F the switch flipped and I really wanted too. During high school, I purchased about every Anne McCaffrey book available. The hot talents and telepathic dragons fought for space on the shelf. Shortly after college I discovered David Weber. I wouldn’t be writing in the genre if it weren’t for him. After earning degrees in vocal music and rhetoric (class of 98 and 2000), I decided NOT to perform for a living. I was descent but not great. The creative juices continued flowing and they needed an outlet. So I dabbled with a few stories and tried my hand at a novel. About twenty-five thousands words in I realized what a horrid read it was and into the trash it went. Years later, my brother-in-law challenged me to write every day for a month and track my progress at NaNoWriMo. He knew about this idea I had for a story and encouraged me to write it. I owe him big. Why SF? What do you enjoy most about writing, and reading, in the genre? I should mention my day job. I work for Penguin Random House, primarily in sales but also a bit in acquisitions. For fifteen years I’ve been privileged to read and sell great reads in just about every genre there is. Every day I get to walk in high cotton. But SF? There’s none like it. A couple of years ago I caught a panel with Jack McDevitt, who is a current favorite. His Alex Benedict novels should be required reading. Jack made a comment about the canvas being too large for us to be alone. SF gave me permission to look up at the canvas and ask why. And, what if? DUNE. Frank Herbert was a genius. And FOREIGNER. Sorry, but it’s impossible to name just one. C. J. Cherryh’s book made me fall in love with SF all over again. After the book tour, I need to binge on some Cherryh. When you’re not writing, and manage to find some free time, how do you like to spend it? I’m outside hiking, or at the dojang (my Taekwondo school), or playing games with my guys. Last week I introduced Andrew (8) and Nate (7) to Risk. I was preparing to invade Poland when they up and quit on me. We have work to do. The next book in the Promise Paen series, IN THE COMPANY OF OTHERS (working title at the moment), is in the pipeline. Books three and four are already plotted. A few shorts need some tending too. Beyond that we’ll see. Want to win a copy of Unbreakable? Fill out the widget below and I’ll pick a winner on (or around) the 30th (US/Canada)! 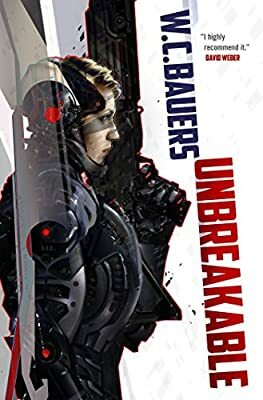 giveaway, interview, Unbreakable, WC Bauers. The 2015 Edgar Award Nominees have been announced!